Spinal compression refers to a condition when there is excessive pressure on the disks between the vertebrae of the spine. This produces symptoms such as stiff back and nerve problems that can affect cognitive and emotional processes. While it is not easy, spinal decompression at home is possible. Many medical professionals and therapists are of the view that certain exercises can help relieve this pressure from your disks. Just be sure to talk to your doctor before doing any special stretches or exercises to decompress your spine. Spinal decompression involves stretching the spine in a gentle way to relieve back pain and alleviate other compression symptoms. Different movements help change the position of the spine to take pressure off your disk, which, in turn, helps reduce pressure on nerves and other structures in the spine. Decompression may also help promote movement of oxygen, water and nutrient-rich fluids into the affected disks to accelerate healing. You may rely on nonsurgical ways to decompress your spine at home to treat neck pain, back pain or sciatica. It also helps treat worn spinal joints, herniated disks and diseased spinal nerve roots. It also proves effective in case you have degenerative disk disease. How to Perform Spinal Decompression in Your Home? If you have pressure in the lumbar region of the spine, you will benefit a lot from this posture. Position yourself on your elbows and knees, while keeping your head straight. Tighten your abdominal muscles while raising your lower back slowly. Maintain the position for 15-20 seconds and then slowly return to the starting position. The posture helps relieve compression of your lumbar spine. Start by lying on your back on the floor. Take a deep breath and then clasp your hands behind your knees. Now, slowly lift your knees up towards your chest. Make sure that your hips are off the floor a bit. At the same time, lift your head up in the air. Hold this position for a few seconds and then return to the starting point. It works great to stretch your spine. Sit on your knees on a yoga mat and lower your head lowly while tucking your arms beside your legs. Ensure that your hands are pointing away from your head. Now, pull your upper body forward until you feel a light stretch in the lower spine. Hold it for a few seconds and return to the starting position. 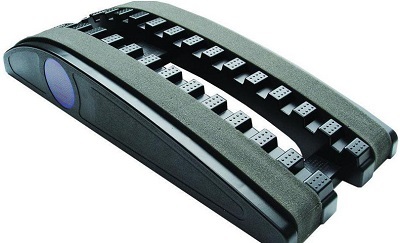 You can also invest in a small traction device made of plastic that helps you with spinal decompression at home. It comes with 30 suspension points that are molded into the center rails. You have to lie on it and let those suspension points give your spine a good stretch. It takes all the pressure away from your back and improves blood circulation as well. 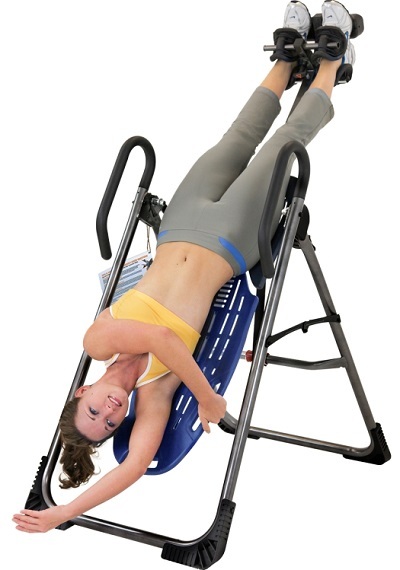 The idea behind this inversion table is to use gravity and the weight of your upper body to extend your spine. Simply strap in and invert your body in a low angle. It is possible to increase the spinal decompression by increase the angle of inversion. These tables are quite effective for bulging disks, herniated disks, pinched nerve, sciatica and degenerative disk disease. back pain. You can get in and out of this machine with utmost ease. Just get on your knees and place your underarms under those pads. Now, slowly lean forward to take pressure off your spine. It lets you take full control of how much traction is needed. You just need to spend 3-6 minutes a day on this machine to relax your muscles. It works better than an inversion table. Who Should Avoid Spinal Decompression at Home? While decompression at home sounds like a great idea, it is not suitable for everyone. You need to talk to your doctor before using any of the techniques mentioned above. Avoid using any of these techniques if you are pregnant or have other health conditions, such as tumor, fracture, advanced osteoporosis, metal implants in the spine, and abdominal aortic aneurysm.